Read on to better understand the king of home improvement retail. Home Depot's (NYSE:HD) stock chart looks like an investor's dream. Shares have marched up 270% in the last five years, trouncing the broader market by about 200 percentage points. It's well known that the home improvement market has posted major gains over that time, and Home Depot has grabbed more than its fair share of that growth. So today, I'm spotlighting a few other important facts about the retailer's business and operations. Home Depot hasn't opened a single store in the U.S. in the last three years -- and executives don't plan to launch a new one in 2016, either. That strategy contrasts with rival Lowe's (NYSE:LOW), which is aggressively adding to its retail footprint. However, Home Depot is still growing revenue at a faster pace, thanks to the popularity of its 2,000 existing locations. Comparable-store sales rose 7% last year, versus Lowe's 5% increase. 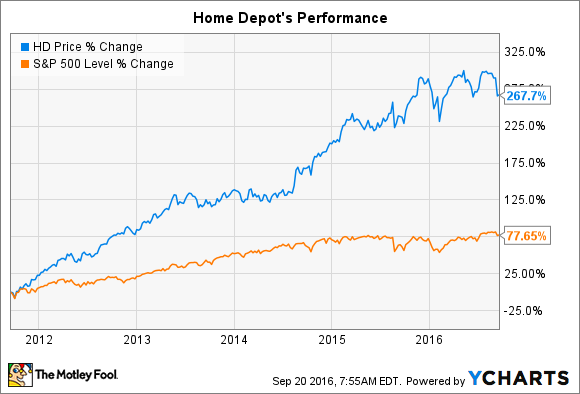 That outperformance has carried on into 2016, too, with Home Depot's 5% comps last quarter again besting its rival. E-commerce sales are a key bright spot for Home Depot and reached 6% of sales in the most recent quarter. Yet investors might not know just how well the retailer blurs the line between its online and brick-and-mortar businesses. For example, its stores are packed with computers from which shoppers can make purchases for products that they might not find in the aisles. These include online stations but also handheld devices carried by employees that can quickly place orders. Even what you might consider pure online sales mostly come with a physical component: Customers chose to pick up nearly half of their e-commerce orders last year by visiting their local store. These initiatives fit into what executives call their interconnected retailing strategy that aims to meet shoppers' demand for multichannel research, ordering, and delivery options. Home Depot has a more aggressive dividend policy than Lowe's, as it targets returning 50% of earnings to shareholders as dividends, compared to Lowe's 35% promise. That approach has produced huge gains for income investors recently, especially as Home Depot's profits have soared in the last few years. But it also may have contributed to the company having to pause payout hikes during the worst period of the housing crisis. That has left just one home improvement giant that can claim a long, unbroken streak of dividend raises. Lowe's payout has ticked up every year since it went public in 1961, which easily qualifies the retailer as a Dividend Aristocrat. Home Depot has no qualms about using debt. It tapped credit markets for $4 billion of loans last year, and executives told analysts in August that they might soon take on more, given that their debt levels are below what they consider to be an optimum amount. "In the past, we've opportunistically taken advantage of interest rates and availability to raise incremental debt," Chief Financial Officer Carol Tome said, "so you should think about our past practice as something that we should continue in the future." The company traditionally turns those funds toward stock repurchases while using cash flow to improve the business -- so another debt announcement will likely point to accelerated buybacks. Executives are bullish on their long-term outlook thanks to economic trends that point to plenty of room for the home improvement industry to keep expanding. That doesn't mean there won't be bumps along the way, though. Home Depot has its hands full with major challenges like integrating the Interline Brands acquisition and rolling out online delivery from stores -- all while maintaining its product authority through the seasonal spikes and troughs. CEO Craig Menear and his team still affirmed their fiscal 2016 sales guidance that projects comps of roughly 5% while earnings climb higher by 16% to $6.31 per share.